Why go on a walk, when you can go on a bear hunt? 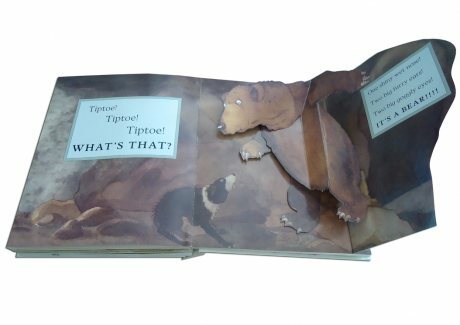 For brave hunters and bear-lovers, the classic chant-aloud story now in a pop-up edition featuring seven pop-ups - what surprises await you with each turn of the page? 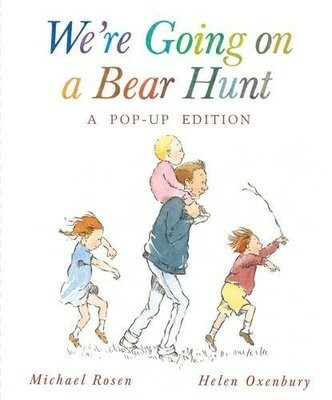 We're going on a bear hunt. We're going to catch a big one. Will you come too? Follow and join in the family's excitement as they wade through the grass, splash through the river and squelch through the mud in search of a bear. What a surprise awaits them in the cave on the other side of the dark forest! For a quarter of a century, readers have been swishy-swashying and splash-sploshing through this award-winning favourite. 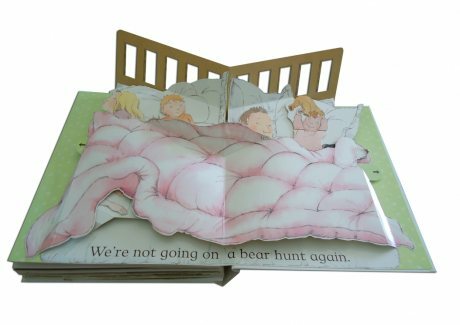 Michael Rosen’s timeless classic, lovingly illustrated by Helen Oxenbury is, in fact, nearing its thirtieth anniversary having first appeared in print in 1989 since when it has become an essential feature on any child’s first bookcase. Shhhhh…. Don’t wake the bear! A former Children’s Laureate Michael Rosen is one of the most familiar and distinctive writers (and voices) in children’s literature having written and collaborated on more than 150 books of stories, jokes and poetry for all ages, including Mustard, Custard, Grumble Belly and Gravy, Michael Rosen’s Book of Nonsense, Little Rabbit Foo Foo and more recently Jelly Boots, Smelly Boots. He’s also a familiar figure in broadcasting, regularly presenting R4 programmes including Word of Mouth and a passionate advocate of reading in schools. Helen Oxenbury’s inimitable illustrations have introduced many children to Alice’s Adventures in Wonderland as well as picture books including We’re Going on a Bear Hunt, Farmer Duck and Ten Little Fingers and Ten Little Toes. My daughter and I, have spent real quality time together with this colourful book. If she forgets it - in time, for a playstation - I'll buy a copy for her 18th!